Theodora’s grandfather dies suddenly, and with his last words he tells her to look “under the egg” for a treasure. Left to look after her eccentric mother in their dilapidated town house in Manhattan, Theo could really use that treasure to make ends meet. Her grandfather’s instructions set her off on a mystery involving lost works of art and her grandfather’s personal history. Theo is a charming, astute protagonist whose seriousness is balanced by her new friend Bhodi, the daughter of two celebrities in the entertainment industry who must constantly hide from the paparazzi. Theo’s eccentric, reclusive mother bent on solving a math equation, their shrill tea-saleswoman neighbor, and a neighborhood full of intriguing neighbors round out the cast. Fitzgerald avoids reducing any of these characters to mere caricatures, instead providing each with a back story and depth. “Under the Egg” is “The Goldfinch” for middle grade readers, with a hint of “The Da Vinci Code.” Not being a parent, I’m not sure what would-be censors will make of a couple discussions of paintings with bare breasts & a brief mention of breast feeding, but I hope it won’t stop too many parents from handing this one to their kids. It’s a thoroughly entertaining mystery, and it definitely peaked my interest in lost works of art. Verdict: Affirmed for fans of art history, mysteries, or solid middle-grade fiction. 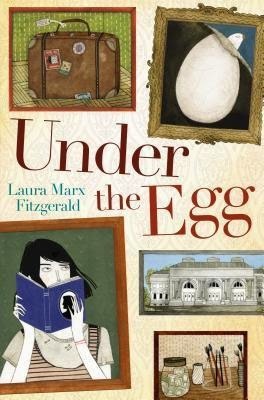 “Under the Egg” by Laura Max Fitzgerald, published by Dial Books for Young Readers on March 18, 2014.